The past few months have been very unproductive for me. Projects have been started and then discarded. Yarns have been rolled or wound up with the intention of starting projects, and then just been abandoned to a basket somewhere in my craft room. At the beginning of October I decided to sort through these (many, many) baskets and start working my way through the yarns. The goal was to just make something! Anything!! The yarn just HAD to be used! I started off with a basket full of Elle Family DK, Elle Pullskein and Lollipop DK (about 22 x 100g) and decided to use that for granny square baby blankets. I succeeded in making four 75cm x 75cm, and one 65cm x 65cm blanket in six days. 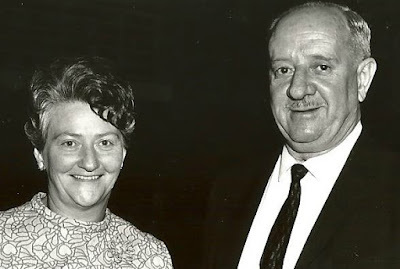 Amazing what little gems were hidden in those baskets! Next up was a basket with a few cones of 4ply intended for blankets and clothes for grandbaby, which turned out to be too thin for me to comfortably work with. 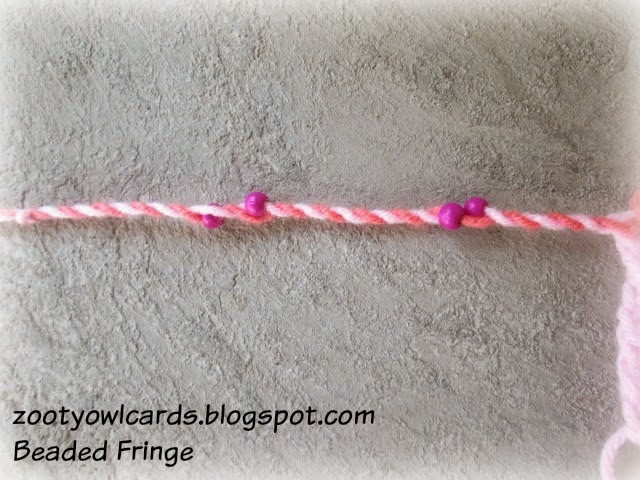 There was a pretty pink variegated cone and two shades of solid pink, which were wound together to form an 8ply strand. I added in some Pullskein in the colour "Snowmoon" left over from the granny square blankets to make a striped rectangular v-stitch baby blanket with a frilly border. 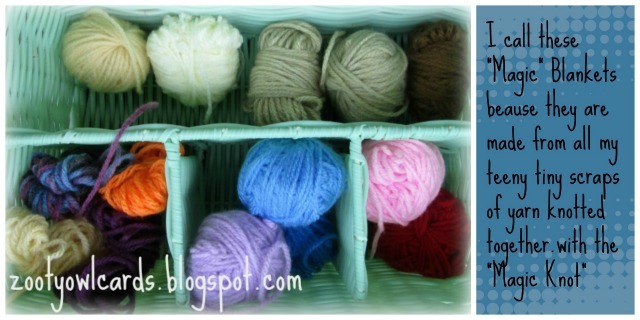 The 4ply was purchased before I knew whether grandbaby was going to be a boy or girl and so I bought pink and blue. The blues have been double stranded and there is enough to make a smallish C2C baby blanket and a SWIRLING SHELLS BABY SHAWL. I am quite over the moon with the number of completed projects. 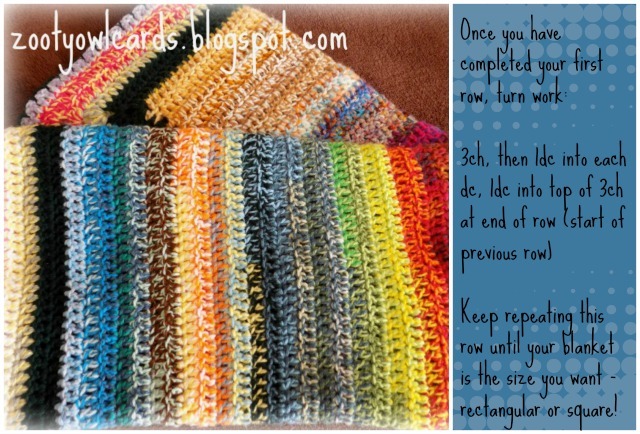 In my next post I will share photos of all the "project de-stash" scarves and shawls made. What are your de-stashing tricks and tips? How do you conquer a creative slump?? I would love to hear your thoughts on this!! 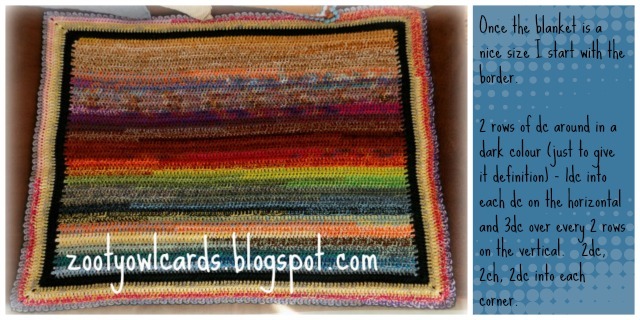 The squares for the SEASIDE WINTER BLANKET went through quite an evolution. A lot of frogging and pulling back was done before they starting looking like parts of a whole rather than just a collection of odd squares. The bits and pieces of yarn that result from this are thrown into a little basket I keep next to my chair. Every evening I do a quick little tidy up before calling it a day. 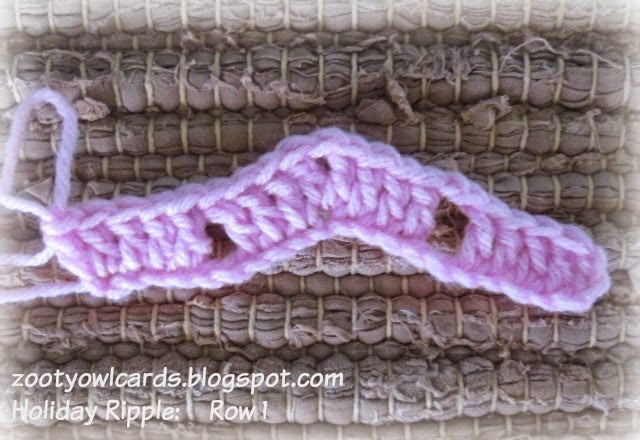 The little scraps are wound together to make what I call "MAGIC YARN". Lately I have been dividing the yarn into two spectrums - red, orange, yellow in one and green, blue and purple in the other (neutrals are shared out between the two spectrums). I love making these MAGIC BLANKETS. The row after row of double crochet stripes makes for very therapeutic crocheting. Perfect as a take-along project or something to calm the heart and mind during times of stress or grief! 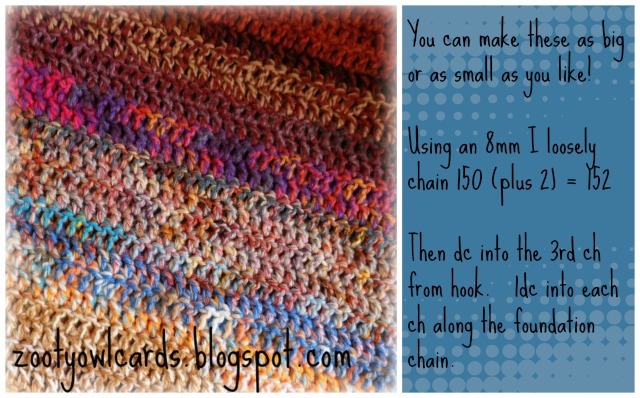 Because the yarn is knotted together there are no pesky ends to work in besides the start and finish ends of the blanket and the start and finish edges of the border. 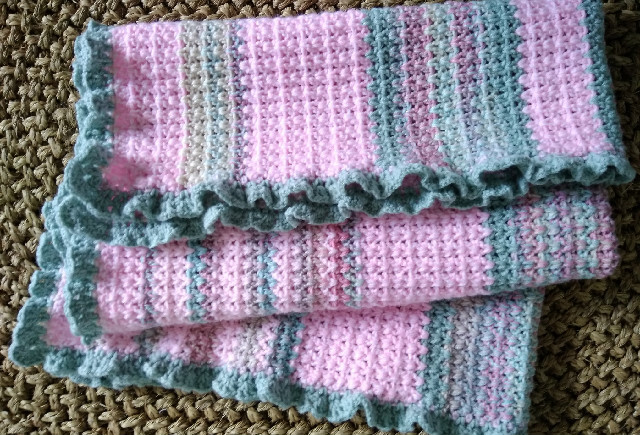 These blankets are fairly robust too - which makes them a good "charity" blanket - either for baby blankets or lapghans for the elderly. 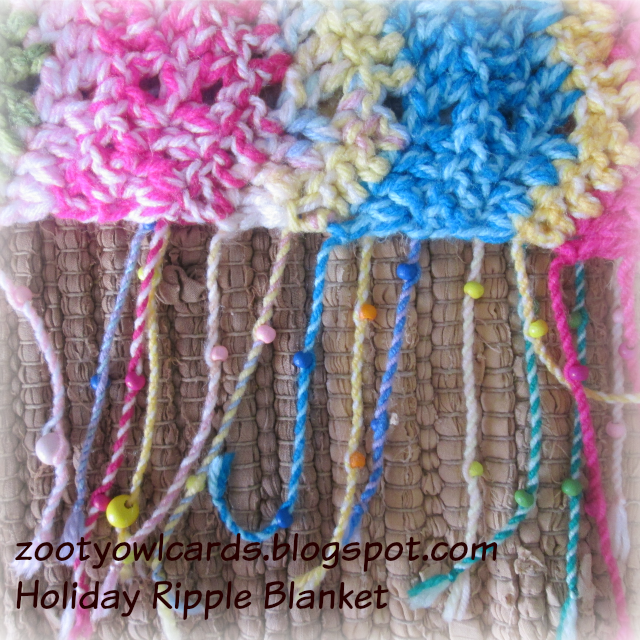 Add an extra bit of "love" to the blanket with a few RUFFLE FLOWERS! The little balls of magic yarn have already started growing again and I intend to use the next batch to make some beanies and scarves for charity. 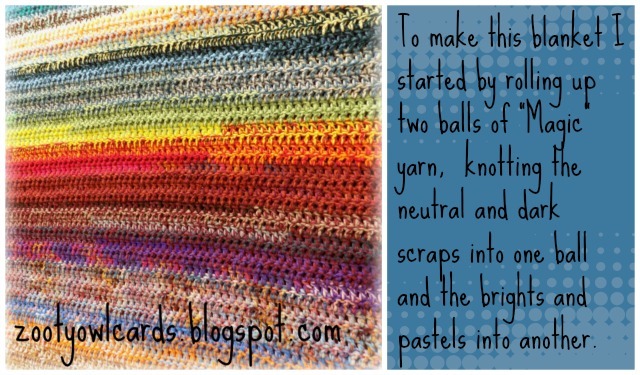 What do you do with your scraps / leftover yarn? 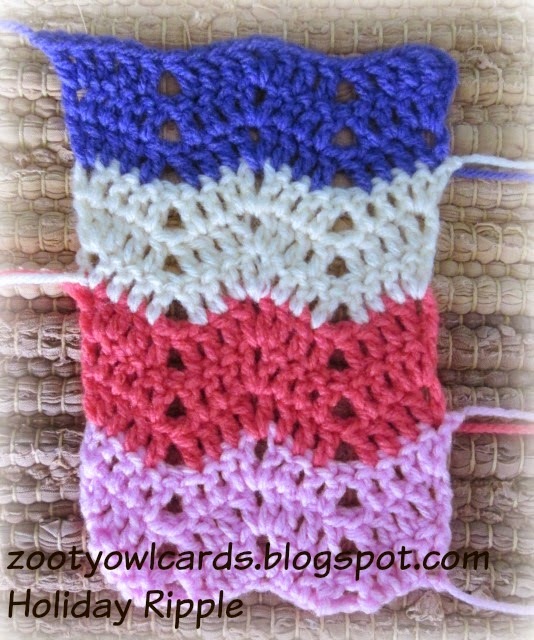 Please post photos of your scrap / stashbuster projects on my Zooty Owl Facebook Page! 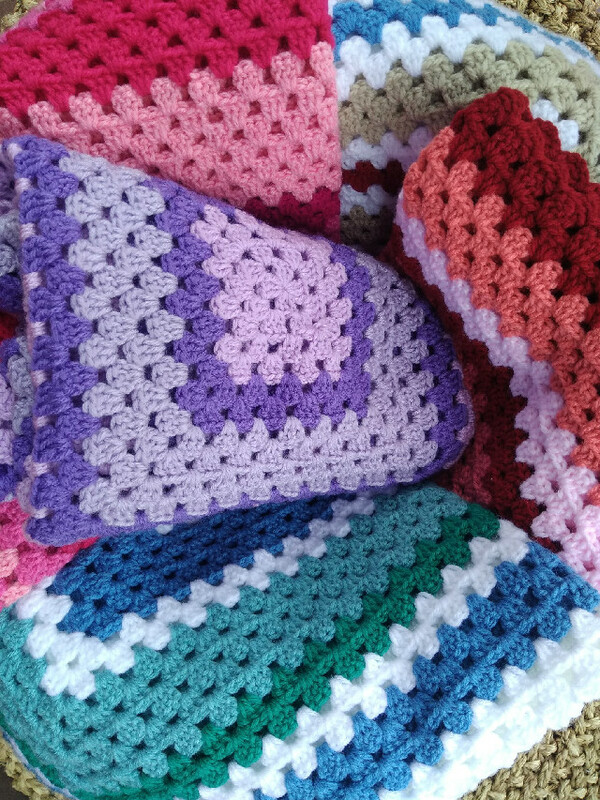 I had best get back to work now - finalizing the "bonus" square and the "Umtentweni" Square for the Seaside Winter Blanket CAL! Happy hooking until we meet again! I have been finishing up the very last little bits of yarn from my mom's stash by making preemie blankets to donate. Having used up all the "nice" yarn, a heap of scrap yarn in a really yucky selection of colours was left over. A good deal of this yarn is what was known waaaaaay back as "HUNKY" - a 24ply yarn!! (In today's terms it is known as JUMBO yarn). I added extra strands to the thinner yarn to make everything 24ply. My original idea was to make a blanket with a mix of stripes and squares - I thought I would work an owl square surrounded by a few granny squares, but it turned out HUGE!! I had already worked a fair amount of the stripes and was not in the mood to frog them! I was undecided whether to proceed with the blanket or to just make two owl cushions. Most people liked the cushion idea. This was such a "silly" project that turned out to be such FUN! I added some "eyelash" yarn for the "feathers", and two over the top ruffle flowers and leaves to fill in the open space at the bottom of the cushion. For the back of the cushion I overlapped two rectangular stripe pieces and then did a buttonhole row to fasten the cushion. 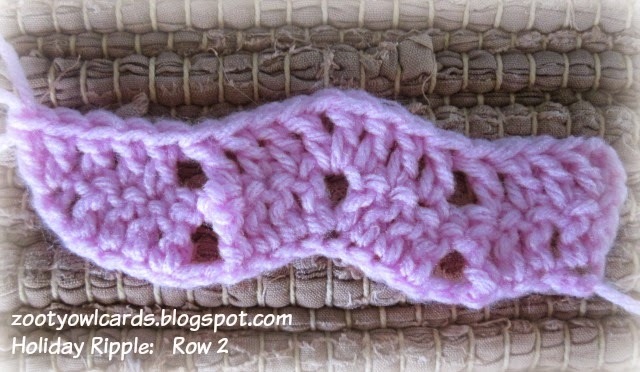 The back and front are joined by a round of single crochet and then finished off with a block stitch edging. Only one of the cushions is complete, the other is about halfway. For the second a different colour selection will have to be used. I am actually thinking of hosting a little CAL, breaking it up into manageable portions over a period of weeks (say over the 5 Fridays in October??). Is it too late in the year??? How many people would join in?? Please leave me a comment so that I can decide whether to proceed now - or leave it until the new year! I cannot believe my mom has been gone for just over a month - it still feels so unreal! I have been working through MOM'S YARN STASH - what a wonderful gift from the "afterlife" as it were. A beautiful way for me to meditate, grieve, reflect and remember my precious Mommy! When I received the stash I decided that I would not "hoard" it but would immediately set about making meaningful things from it! So far I have made a few baby blankets, a "MAGIC" COMFORT BLANKET for my brother, for each of the girls I have made a super chunky ROAD TRIP SCARF!, and this HUGE comfort blanket for my Dad. Border: 1 round hdc, 1 round dc. Edging: A simple half shell made as follows (2ch, 2dc, skip 2 spaces, sl st into next space) repeat all around the blanket ending with a sl st into the base of the start 2ch. The blanket will fit very comfortably on a double bed. 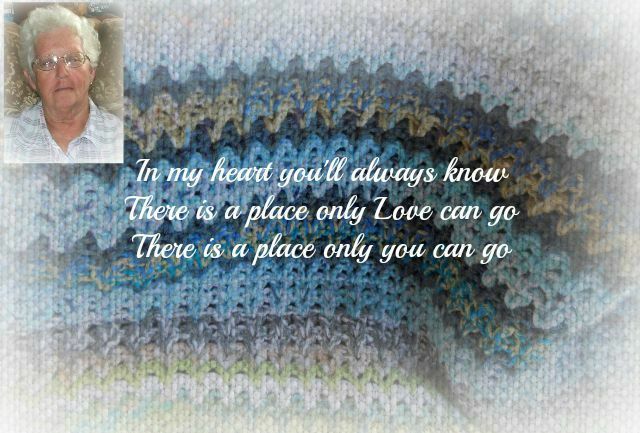 It's soft and thick and warm and was made with loads of love with good memories of my mom in every stitch! 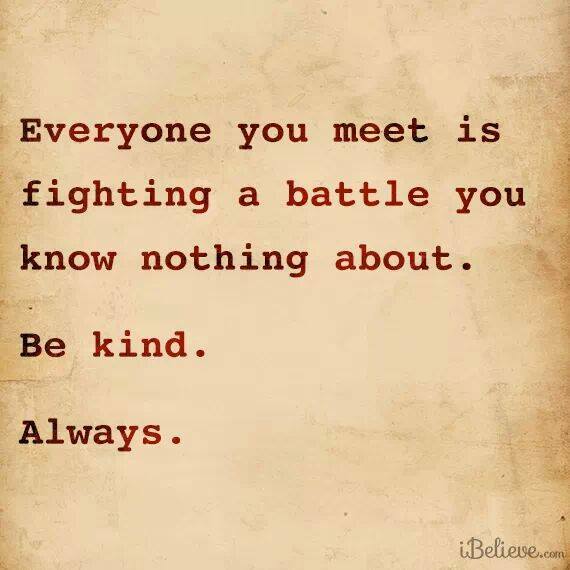 ..... and the lessons my Grandparents taught me! 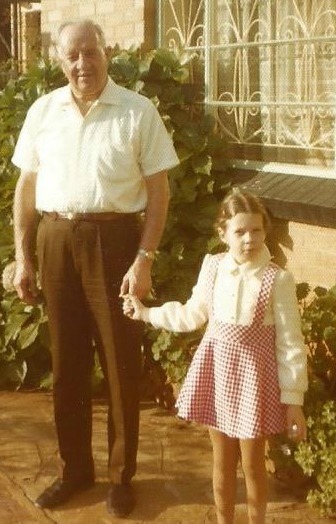 My Oupa (grandfather) and Nanna (grandmother) lived in a big old rambling house when I was a little girl. 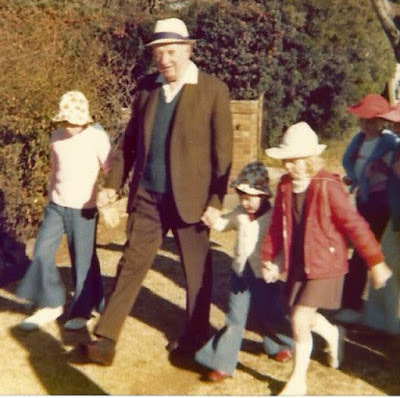 I spent most of my waking hours with my Nanna and a lot of time with my Oupa (who was semi-retired). Never disrespect yourself by being untidy, unruly, rude or improperly dressed! No matter what their station in life! 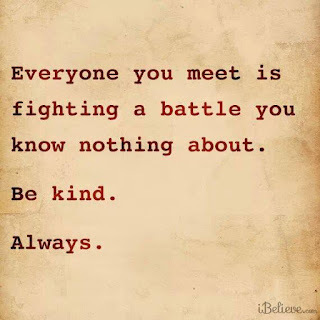 There is absolutely no excuse for rudeness or discourtesy! Anything worth doing is worth doing well! Having food to prepare and eat is a blessing! Show your thankfulness for that blessing by preparing and eating your food with a happy heart. I always have a good giggle when they speak of "cross-contamination of food" on Food Network - I always tell my children this means that you must never make food in a bad mood!! Be grateful for every meal! Eat your food mindfully - never shovel food into your mouth! 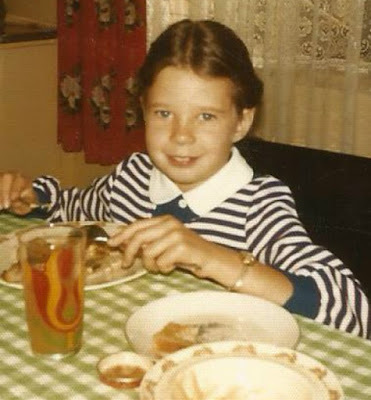 Me - at breakfast time! When you are done sleeping, make up your bed! When you are done bathing, clean the bathroom! When you are finished using something, pack it away! Tidy and clean the kitchen as you cook or bake! Pack away your laundry as soon as it is done! If you are fretting about something make yourself a cup of tea and drink it mindfully!! Once the words have passed your lips or the actions have left your hands they can never be taken back! Get out there and participate!!! Take responsibility for your own actions! It means nothing if you do not atone and change your behaviour! Lazy people look for excuses - industrious people find solutions! Waste not - want not! 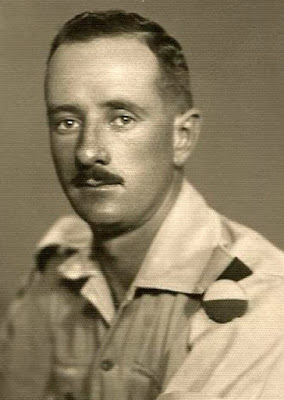 My grandparents grew up through the depression and lived through WW2. They knew what it was to go without. They taught me to use my imagination to turn scraps (paper, wood, yarn..... almost anything) into fun and useful projects! I never was (and still never am) bored - I just need to apply a little imagination to whatever is to hand and "magic" happens!! 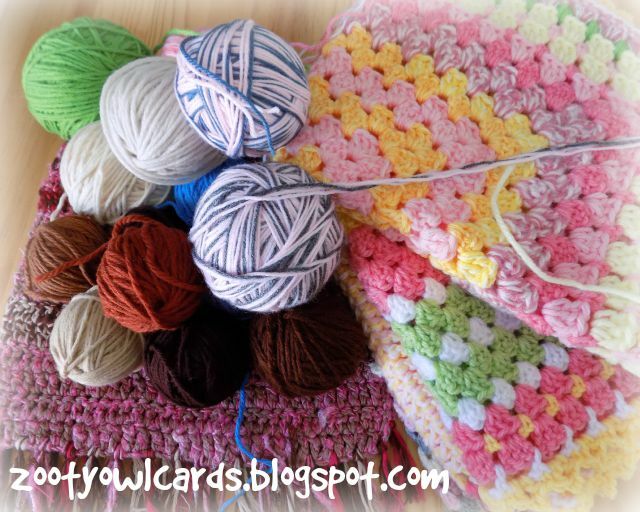 Keep your hands busy doing something constructive (knitting, crocheting, baking, cleaning, gardening, being helpful). When you sit around doing nothing trouble comes looking for you!! Don't let Evil Sully you! No matter how evil or horrible the world around you maintain your own goodness! 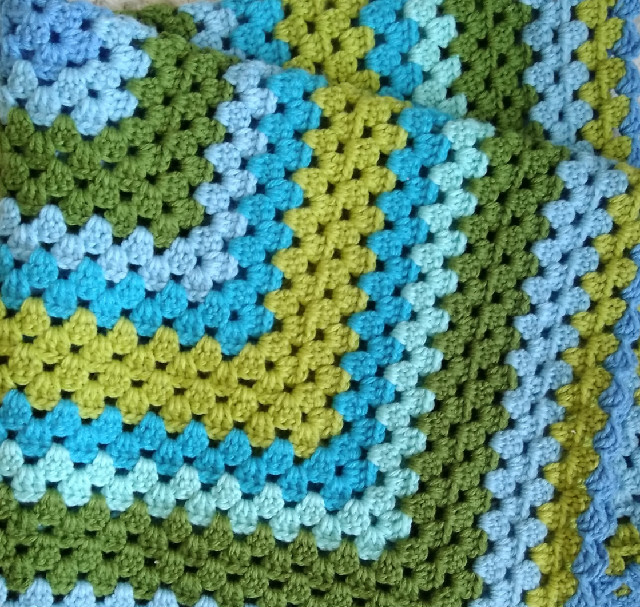 These blankets are a great side project to keep going and when winter comes you will have quite a few blankets to donate to your favourite cause! The end result is a super snuggly, soft and warm blanket! 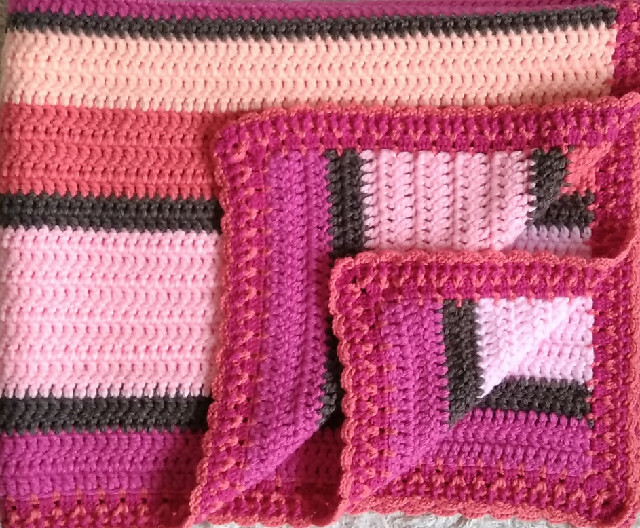 Each and every blanket is unique and you can use up your scraps as you go!! In an effort to use up all the less than full balls of yarn as well as the "odds" and "uglies" in my DK Acrylic stash, I rolled two 8ply strands together to make some "Super Bulky" 16ply yarn! Note: It may be easier to "double-strand-as-you-go" - by that I mean crocheting the yarns together as you go and not pre-rolling as I did! 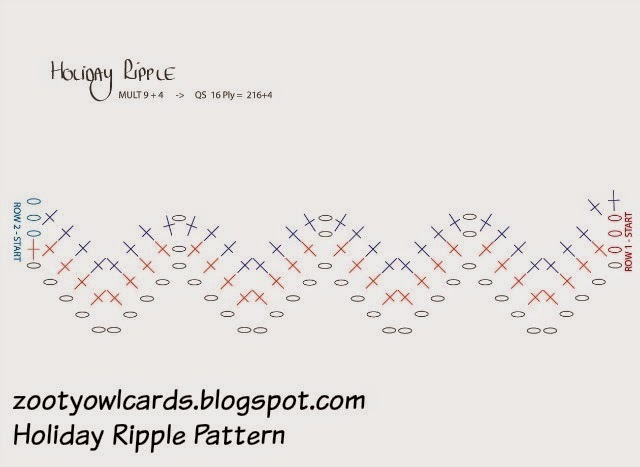 After a bit of trial and error I came up with this ripple pattern for a blanket! Since there was quite an odd collection of colours and quantities, I crocheted random stripes! 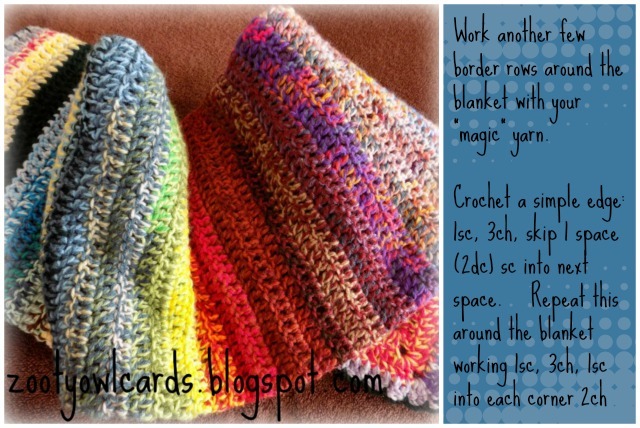 This "Super Bulky" yarn works up in no time at all and is the perfect project for a rainy weekend! I estimate having used approximately 1800g to 2000g of yarn. I decided to keep the fun element by not bordering the blanket and making a beaded fringe with the tails instead! Keep repeating Row 2 until your workpiece is the required length. Thread beads of choice randomly onto the tail at the end of one row and the tail at the start of the next row. Hold one tail between the thumb and forefinger of your left hand and the other between the thumb and forefinger of your right hand. 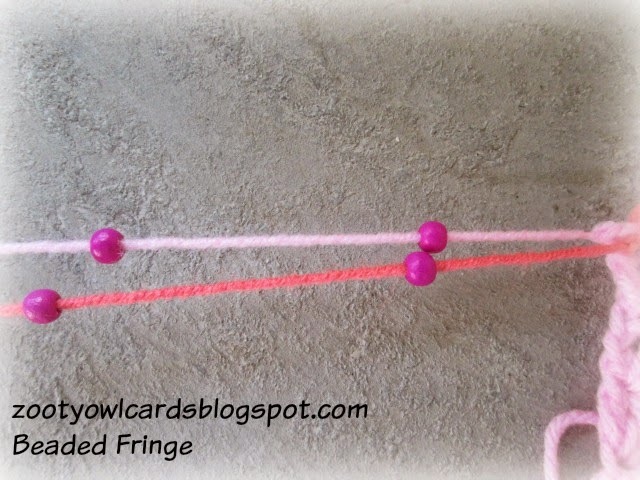 Start twisting the yarn tighter in the same direction as the twist of the yarn tails.